If you find that you need to set up information for one of your lists where there is no corresponding field, you can assign a Custom Field to fill that role. For example, if you're in the habit of sending your customers a greeting card every year on their birthday, you can establish a custom field that will let you track their birthday information. Using the Custom Fields function allows you to establish your own criteria for each one of the Types (i.e. PO, Sales Orders, Repair Orders etc.) by creating a custom field where additional action is required. In addition to information, custom fields can now contain calculations. Calculated Custom Fields allow you to create complex inventory formulas and add them to any Page or List in Order Time Inventory. To create a custom field you must be logged in as the Admin user. Click on the Gear icon on the top right of the screen then select Custom Fields under the Settings Section. In the scrolling list, on the left-hand side of your screen you will see a list of Record Types for which to create the Custom field. 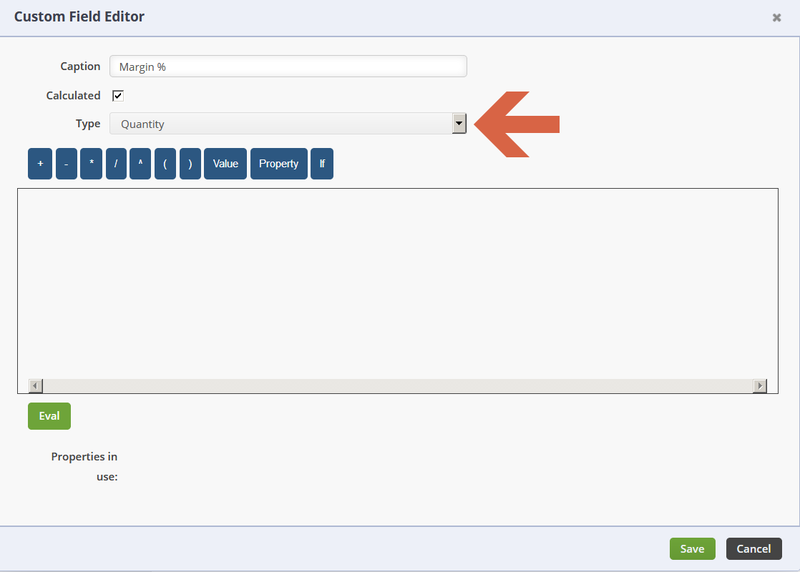 For example if you want to create a custom field for a customer, click the Customer Type from the left-hand side list. After you click the desired Record Type, you will see a list of custom fields. The list contains the following columns. Type - Is the type of field the user will be prompted to enter (i.e. Text, Date, Pick List, Yes/No). Delete - Remove the custom field. Click an existing Field or click the Add Custom Field. The First thing you will enter is the Caption that will appear when users enter their data. After writing the caption, you will select if the user is Required to enter a value in the custom field before being able to save. Alright let's create a basic calculation and add it to our Item Detail Screen & Item List. This is the amount of gross profit a business earns when an item is sold. For example, if you have to pay $15 for each sweater and you then sell it to customers for $39, your retail margin equals $24. This in turn is a 61.5% Margin. - Choose Properties by clicking on Property. When chosen they will appear in the expression window. - Click Value to add a numerical value. For example the number 100 in the expression above. - Click If to create an If/Then Statement. - Click and drag Mathematical Operators (+ - / * ^) into the expression window. Then drag them into the position you want. - Click Eval once you are finished making your expression. You'll receive a Pass message, letting you know the expression works. - Click Save when you are finished. 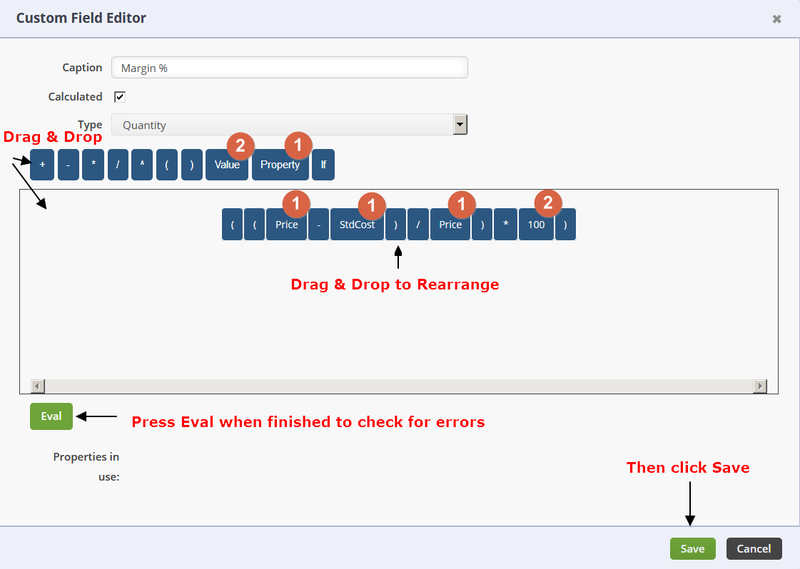 Now when you go to an Item Details page and click the Custom tab, you'll see the new Margin % field.